− one = zero Required Please enter the correct value. This is a story we've been hearing a lot lately: The stock market is near fresh all-time highs, and the retail sector is at dismal lows. In fact, the sector's top exchange-traded fund, the SPDR S&P Retail ETF (NYSE Arca: XRT), is already down 2.2% year to date, and it's off nearly 11% from its 52-week high. The "official" outlook is even bleaker. Some television pundits are predicting the "extinction of retail" in the not-too-distant future. JPMorgan Chase & Co., America's largest bank, is recommending its clients take a bearish approach to trading the sector – if they trade it at all. The thing is, I agree. Retail is in terrible shape. It has largely failed to adapt to the changes that are now destroying it. And in a minute, I'll show you a creepy picture that proves it. But there's a big difference here that matters to investors: I'm not willing to write off an entire sector – not when there's this much upside to be had from a few choice stocks. These three companies chose to adapt to shifting consumer behavior before it was too late. They did better than that, in fact – they made the change in consumer habits work to their own advantage. And now their shares are actually set to outperform. The more brick-and-mortar operations close, the more malls are abandoned, the better these companies will do. Last Saturday, my wife and I decided to spend the day shopping in the Westfield Mall, which is a commercial property that handles several different retail outlets both within the United States and abroad. 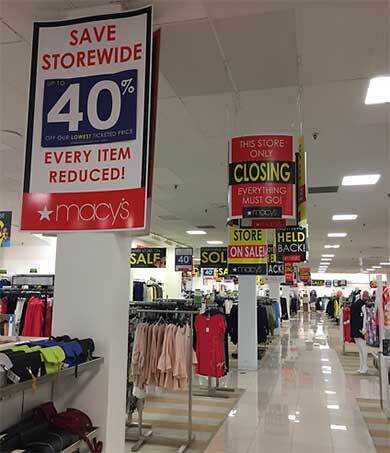 Understandably, people are shopping less now that the holidays are behind us… but I was really surprised at the lack of shoppers flocking to all of the clearance and store closure sales, like Macy's. Now, I'm not a retail shopper. I went cyber long before it was cool to shop online. In fact, the only reason I go to the mall is to visit the Apple store or the Tesla dealership that sits across from it. I spend 99.9% of my time shopping from the same terminal I'm writing from: my computer. But there's no denying that malls are becoming more like sanctuaries from the hot summers and cold winters or recreation parks. In a lot of malls, there are even signs now that tell you how far you've walked. This past week I had the opportunity to visit a mall where I opened a store in 1987 and just thought I would stop in and see the mall. Whoa, what a depressing visit. One main Anchor (fronting the main road) had closed some years back and has remained vacant. Three anchors left with Macy's also fronting the main road with Sears and Penney's on the back side. Macy's store exterior was originally white but now is covered with a graying slime that is beyond my understanding. A simple wash/scrub would rejuvenate this making it much more so inviting. Walking though the store is much the same with flickering lights, no visible staffing and an eerie empty feeling. The mall itself has 48 vacant spaces of the 110 originally opened. There isn't even an attempt to cover the glass or clean up the interior of vacated spaces. Of the remaining stores there were few national brands still open. Victoria Secret, Gold's Gym, Foot Locker and two recognizable restaurant fast food chains in Chick Fil A and Sbarros. I remember this mall when it opened to great fanfare and found myself a bit depressed upon leaving the building. I sat in the parking lot convinced that the cancer I saw happening in the late 80's is now in stage 4 with the patient on complete life support. I also remember when PVH had over 1200 outlet stores between it's divisions. The outlet centering of America was about 20 years behind the Malling of America so their fate will mirror regular retails demise somewhere near 2025. Out of that business now I own my own retail and have found ways to prosper with the introduction of a digital marketplace and through amazing customer relations. I'm on the 6 year plan as I wind down my career but will never fully leave the business until they carry me out toes up. Thank you for an insightful and well done article.